This smartphone cleaner kills bacteria and wipes smudges, streaks, and oily fingerprints right off the screen. SmartKlear uses an invisible carbon substance that repels dirt and oil—the same technology used in the NASA space station. After each use, replace the wiper into the cap. Carbon pads on each will shift and create a fresh cleaning surface for next time. Dimensions: 3" x 0.8" x 0.5"
This cleans my phone’screen quickly and well. Thanks! I love this but the best thing about it are the reactions of other people when they see it. Everyone who sees it wants one. Cleans your screen just like the picture shows. I have tried so many things to clean with and this is so far the best. 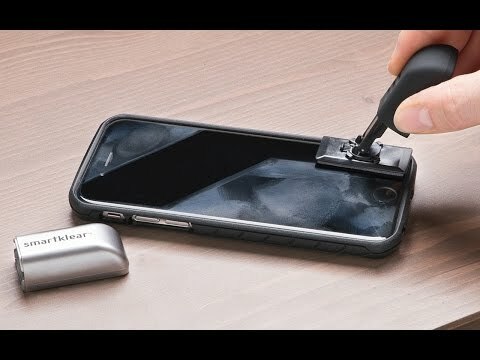 Watch your screen become squeaky clean with this simple smartphone cleaner. SmartKlear’s carbon cleaning technology is actually used by NASA in their space station. After you’ve swiped the pad across the screen a few times, your screen will be clear. 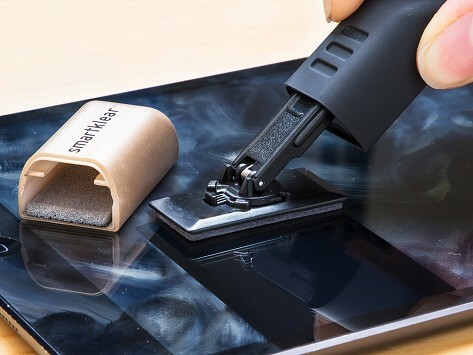 Then, when you replace the pad into the holder, the friction between it and the pad in the cap causes the carbon molecules to shift—giving a fresh cleaning surface every time. Needless to say, we use and take our phones everywhere. All that travel and touching makes them a breeding ground for bacteria. SmartKlear’s all natural antibacterial formula will get rid of your phone’s sneaky biosphere. Keep this device handy in your pocket or let it be a permanent resident in your backpack. If it’s good enough for space shuttles, it’s good enough for your screen.